BLOOMFIELD HILLS, Mich., Feb. 12, 2016 – Automotive Fine Arts Society (AFAS) member Charles Maher has been invited to feature several of his paintings as part of a new automotive exhibition entitled “Capturing Design: Masters of Automobile Art” at the Alden B. Dow Museum of Science and Art in Midland, Michigan. Known for using a wide variety of mediums and techniques, including watercolors and acrylic paints, Maher’s paintings are on display Jan. 16 – April 3, 2016. The automotive exhibition features a diverse collection of paintings, sculptures and designs that range from classic American and European marques or customs, to Formula One, NASCAR, street rods, and other racing designs. 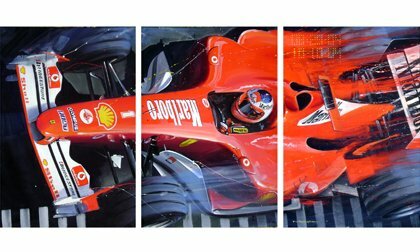 In total, Maher has 25 paintings on display that cover the spectrum of his work including classic cars, Formula One racing and cultural car scenes. Maher grew up in Miami, Fla. Destined to work with cars, he began his automotive journey at the wheel of his family’s 1955 Chevy Bel-Air and Chrysler 300. He earned a bachelor’s degree in Fine Art from the University of Notre Dame in 1968. After working as a designer for Ford Motor Company, Maher spent 14 years with a Detroit firm designing production car graphics for Ford, GM, Honda and Toyota. His projects included pace car graphics for Indianapolis and the Long Beach Grand Prix. Maher’s work is sought after by automobile and racing collectors worldwide and has been featured at famous automotive events including Pebble Beach, Concours d ‘Elegance events at Amelia Island, Ault Park, Greenwich, Meadow Brook, the Inn at St. Johns and the Eyes-on-Design Exhibition in Grosse Pointe, Michigan. His artwork has appeared in AutoWeek, Automobile, Car Collector, Mustang Monthly, Racer, Road & Track, Automobile Quarterly, and Sports Car Market magazines. For information about Charles Maher’s art, visit http://www.doctor-design.com/maherautoart/index.html.